A rainwater to mains water switch helps you make the most effective use of your tank water. It allows you to use your tank water supply first and then switch to mains water supply if your tank is low or empty. This set up ensures you maintain a reliable water supply to your toilets, laundry and other areas. Device manufacturers claim you can reduce your mains water usage by as much as 40% when a switch is connected to your plumbed-in rainwater tank. less mains water usage, reducing your water bill. The switching device sits between your pump, your mains supply and your house inlet. It then either automatically detects the tank level then switches to mains water if the tank is low or empty; or you can manually switch between the two water sources. A backflow prevention device (also known as a dual check valve) must also be installed so that water from your tank cannot enter (and contaminate) the mains water supply. Backflow prevention devices are available in three hazard ratings: high, medium and low. Because of the risk of mains water contamination – high and medium rated devices must be tested annually by a licensed plumber. An automatic switching device detects when rainwater is low then switches to mains water. It typically uses either a float switch in the tank, or detects the tank water levels based on pump pressure. Because it is automated, it provides you with a continuous water supply but it costs more than a manual switch and requires electricity to run. A manual switching device requires you to go outside to your tank and manually open/close the tank and the mains valve. While manual switches tend to be reliable, cheaper and don’t use electricity, you need to leave the comfort of your home each time you want to adjust your water source. While a manual device would suit most homes, some states actually require that an automatic switching device is installed – such as South Australia and some areas of Queensland. Make sure you check your local council requirements if you are unsure. 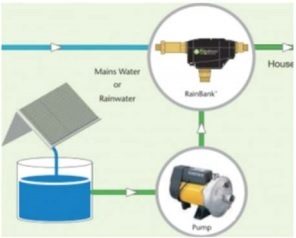 If you are looking for an automatic rainwater to mains switch, Team Poly recommends the RainBank mains water backup system which can be mounted to the top of your tank, or on a nearby wall. If you would like further advice, contact us today.